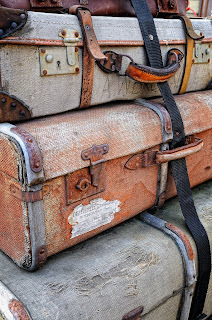 The BOOT - The Business of Online Travel: BOOT needs new luggage - any recommendations? BOOT needs new luggage - any recommendations? I need some new luggage. I need a coat carrier/garment bag that can go on board and a roll bag that can go on board. A roll bag big enough for a pair of shoes, general wear and a laptop. Any recommendations? Tim, it has to be personally monogrammed Vuitton. Nothing else can guarantee the theft of your luggage the first time you use it. I've started to use TelePods. You know like in the Fly movie. i put my luggage and suit etc in and dial up the hotel room that I'm staying. and Walla my luggage is there when i get there, and no creases! i don’t trust actually travelling in the Telepod though, given what happened to that guy Jeff Goldblum. Tim, you could try something salubrious from the J Peterman catalogue. Fun fact - John O'Hurley, who played J Peterman in Seinfeld is now a part owner of the real J Peterman company.